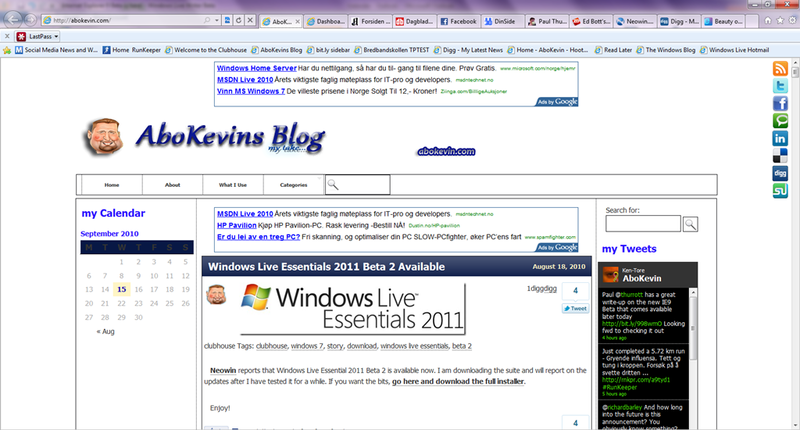 AboKevin.com » Internet Explorer 9 Beta is here! 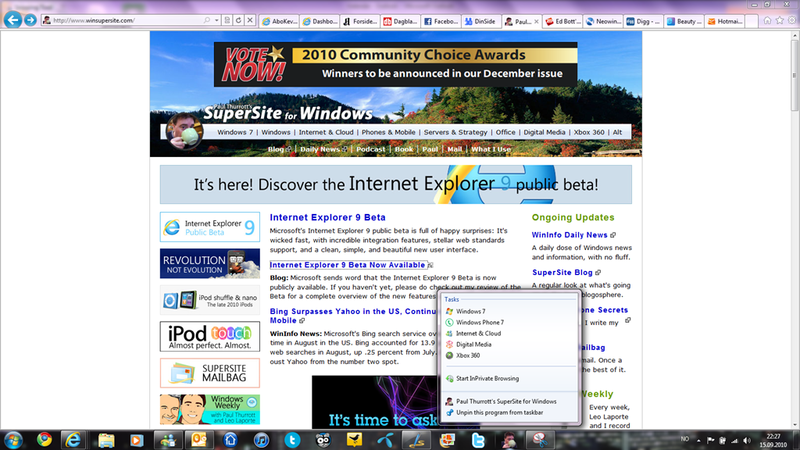 HomeMicrosoft Internet Explorer Internet Explorer 9 Beta is here! Today, September 15th 2010, Internet Explorer 9 Beta went public. And the only way to sum up my first impressions is – wow – IE is back in the game. I have been using Google Chrome for the last year. I like its simple user interface and speed, compared to IE 8, which became slower and slower to me. 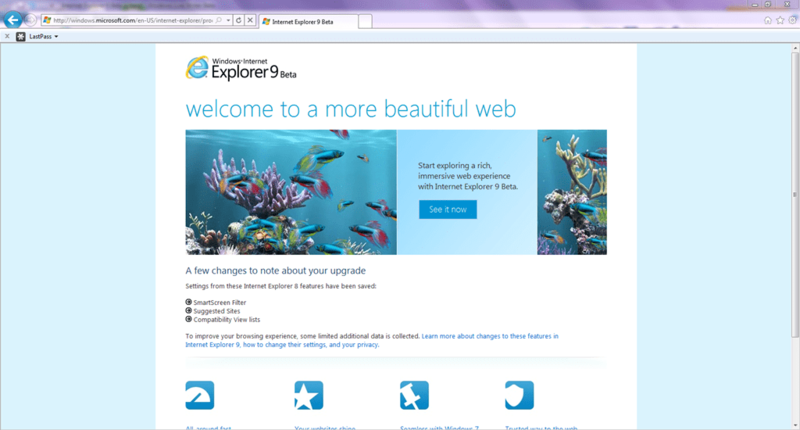 IE 9 on the other hand is slick, slim and fast. I will test the browser more thoroughly in the weeks to come, and will for now only show you some screenshots with my comments after a few hours use. For more in debth information Ed Bott and Paul Thurrott have both written up their impressions after a few weeks use and both articles are really worth reading. 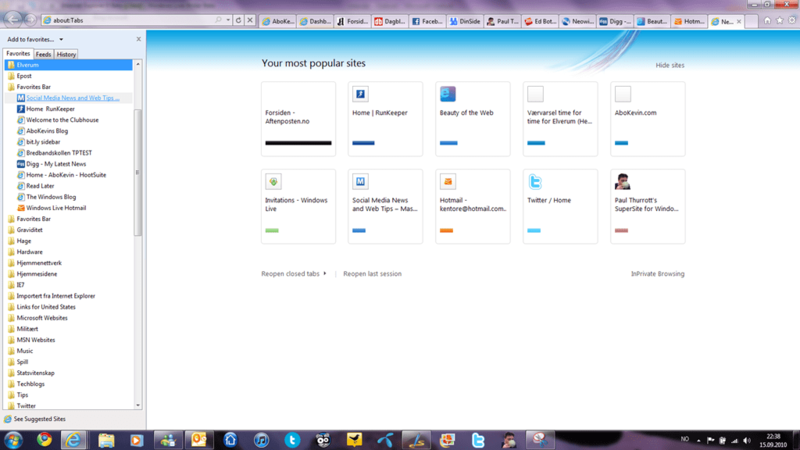 My homepage setup in IE 9 Beta with the LastPass add-in and the Favorites bar. 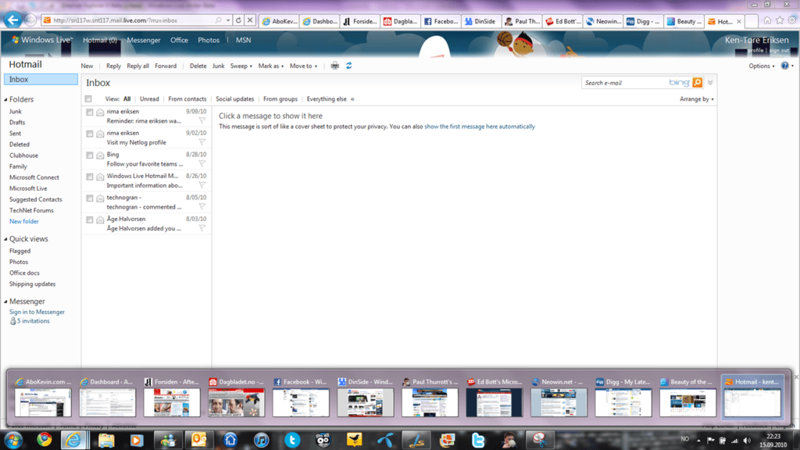 My Hotmail inbox with the taskbar preview of all the tabs showing at the bottom. 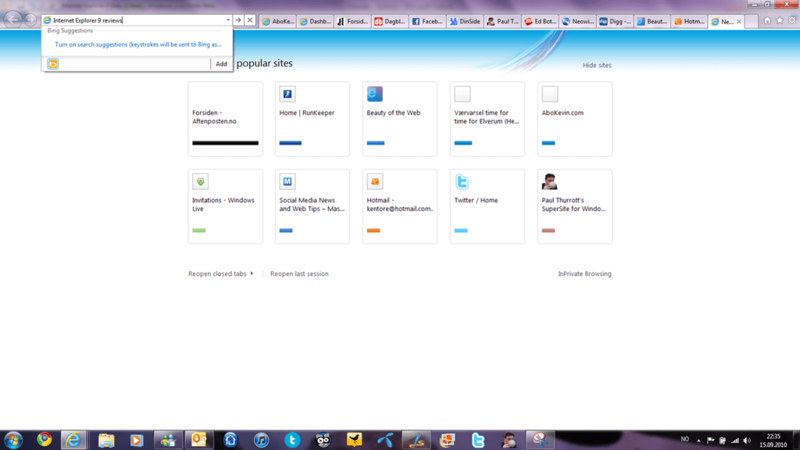 IE 9 Beta allows you to pin tabs to the taskbar, and for sites to make spesific jump lists for their sites. Paul Thurrotts’ winsupersite.com already has that functionality enabled as seen on this screenshot. The open new tab displays this page. Yes, there is definitely something similar to Chrome here, and I am pretty sure that a lot of people will compare IE 9 Beta to Chrome due to this and the general layout of the browser. It still feels different in all the right places. Like in Chrome you now search directly from the addressbar. But unlike Chrome the more secure option is default and you have to actively select to turn on search suggestions – which means that your keystrokes are transmitted over the net. Here I have locked the Favorties pane on the left, and here I am missing one of my simple but favorite UI solution from IE 7 and 8; the little blue arrow that pops up on the right side of your bookmarked links which enabled me to with just one click open the link in a new tab. Here I either have to right click and then choose “open link in new tab” or hold down CTRL while clicking the link – Microsoft – please bring back the blue right arrow.